Nobody likes a spill, but when it happens in an industrial workplace, it can be more than just an inconvenience. Chemicals, oils, and contaminants can not only damage your facility and equipment, but can also present health and safety hazards — and even environmental concerns. Being prepared for spills isn’t just smart — it’s required. The Occupational Safety and Health Administration (OSHA) regulations state that facilities with more than 1,320 gallons of above-ground storage and 42,000 gallons of underground storage are required to have a Spill Prevention, Control, and Countermeasures (SPCC) plan. And even if your numbers aren’t quite that high, it’s still smart to have a plan in case of a spill. That’s why it’s absolutely imperative to have spill containment pallets on hand in case of emergency. 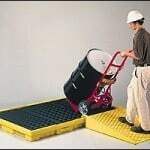 Luckily, we offer six different types of spill pallets to meet your specific needs. Spill Pallets and Platforms — These traditional pallets will hold one to eight drums. These units, available in high or low profile, are easy to load and unload and can connect to handle more drums as needed. If you have aggressive fluids that are not compatible with polyethylene, we have fluorinated models available. Economy Spill Pallets and Basins — Available in one-, two-, and four-drum models. Our new, flexible models, available with or without grates, come in one- to six-drum sizes. Outdoor Drum Storage — We have a broad selection of covered outdoor spill pallets. Choose from spill pallet building, roll tops, lift tops, and flip-top covered pallets. IBC Spill Containment Pallets — We offer standard, modular, and hardtop intermediate bulk container (IBC) containment pallets. Stackable and Drum-Dispensing Workstations — These space-saving units allow you to safely dispense chemicals, and are also available covered, for use indoors or outdoors. Portable — For use in vehicles, for temporary storage, and for emergency use, these affordable units are easy to set up for quick clean-ups. Don’t let a spill catch you unawares. Make sure you’re prepared for any eventuality with our spill containment pallets. Have questions about which absorbents are right for your needs? Contact Travis Zdrazil at travis@absorbentsonline.com or (800) 869-9633. See a Spill? Wipe It Up Fast! No matter how hard you work to prevent spills, some are just inevitable. The best thing you can do to be prepared for spills is to have the proper cleanup equipment in place and ready to go in case of a problem. Your cleanup equipment will vary based on your facility and your needs, but there’s one simple tool everyone can benefit from: industrial wipes. These versatile tools should be an integral part of your spill cleanup kit. They’re key to keeping your facility clean and safe, day in and day out. Industrial wipes and towels can be used for everything from dust removal to pre-painting surface prep; from absorbing oils and chemicals to cleaning windows. Keep them around for employees to use to clean their hands and maintain or polish equipment. Our Shop Towels work just like cloth, but without the lint! Made with 40% recycled material, these super-absorbent towels are strong enough to withstand scrubbing, but safe for workers’ skin. Tired of spending your money on rental towel services or paper towels? 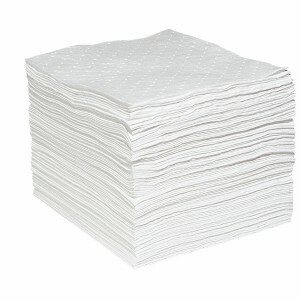 Our reclaimed Shop Rags are quality checked and available in 25- and 50-pound dispenser boxes. These inexpensive, convenient rags are just right to clean up small, day-to-day spills — before they can present a hazard. Need something stronger? Our Industrial Wet Wipes contain degreasers that cut through oil, tar, grease, and paint. These versatile wipes will help clean up those stubborn spills that need an extra push. We even produce specialty wipes for glass and stainless steel. One of the most essential best practices to keeping your workplace safe is good housekeeping. Keep it clean and safe with the right cleanup materials on hand. Want to learn more about absorbent materials and housekeeping supplies? AbsorbentsOnline can help. Contact Travis Zdrazil at travis@absorbentsonline.com or at 800-869-9633. When you reach for an absorbent sock to contain spilled or leaking fluid, do you stop to think about the sock’s color? You should! Color coding doesn’t just look nice. It has a serious purpose: to help workers respond to a spill quickly and clean it up safely. Each color indicates the sock’s purpose and serves as a safety precaution for workers in the spill area. Color coding offers several advantages. First, the sock color informs workers at a glance about the spill type — alerting them to steer clear of dangerous spills if they do not have the right safety equipment. Second, color coding can help you train new employees about spills and which socks they’ll need to clean up different substances. Finally, the color coding system saves you money. Using the wrong sock for a spill is a waste of resources, but when the color clearly indicates the sock’s purpose, mistakes are less likely to happen. Color coding systems vary between businesses, but AbsorbentsOnline has fine-tuned a smart, easy-to-understand coding system for chemical socks. Yellow indicates a chemical spill absorbent sock for aggressive and non-aggressive fluids. Although a yellow sock is typically used to contain acids and bases, you can also use it to contain unknown liquids. The bright yellow color makes a hazmat chemical absorbent sock stand out from its surroundings, warning employees to avoid coming into contact with the sock unless they have the proper equipment. White socks are used to absorb oil-based fluids (hydrocarbons). They repel water as well, and will not sink even when saturated with oil. Use oil-only absorbent socks to dike and absorb spilled oils. Grey socks indicate general-purpose use. They are the best choice for industrial applications in containing non-aggressive fluids. The grey color is designed to hide dirt and blend in with surroundings, and the socks are commonly molded around leaky equipment and machinery. The grey universal absorbent sock indicates to workers that the absorbed fluids are not dangerous to handle. Because the absorbent socks are non-biodegradable, you can wring them out and reuse them, which saves you additional money on recovered spilled fluids and on the socks themselves. If you don’t have a color-coding system for your own facility, take advantage of AbsorbentsOnline’s system for decoding the purpose of absorbent socks. Your employees — and your wallet — will be better off for it. Don’t Cry Over Spilled Fluids — Recover Them! You just spilled a container of fluid in your workplace. You’ve followed safety procedures, and cleaned up the mess with a sorbent mat, towel, or rag, but it’s impossible to recover the fluid you just wasted … right? No matter how careful you are, spills are bound to happen. Besides being dangerous, spills also waste valuable resources. But having wringers on hand can help you recover much of what was spilled — and save your business money, too. 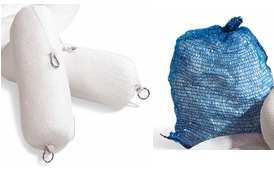 Did you know that wringers for absorbents can recover up to 90% of absorbed fluids from most sorbent mats, towels, or rags? When used with reusable absorbent pads, a wringer can greatly reduce spill costs and chemical fluid waste for your facility. According to the U.S. Environmental Protection Agency (EPA), using a wringer could save a company 51 to 75% a year, mainly on sorbent pad disposal costs. Furthermore, a wringer can pay for itself in just 2.8 to 5 weeks. AbsorbentsOnline offers three different wringer models to suit your business’s needs. Each of these hand wringers offers a variety of benefits. Economy Model Wringer — The all-steel frame is rust-proof, and the bearings never need to be lubricated. An adjustable screw in the center balances pressure over the length of the roller. Standard Model Wringer — This model has dual gear-driven, 12-inch-wide chemical-resistant rollers and a built-in, anti-spill valve. You can mount this wringer to a closed-head 55 gallon drum. Pro Model Wringer — This heavy-duty wringer has 19-inch rollers that can take 18-inch absorbent pads with no folding, and up to four 3-inch socks. A hands-free electric motor drive is optionally available for this model. AbsorbentsOnline can also provide the wringer with custom extractor widths and voltages for your specialized needs. So the next time you spill fluid in your facility, don’t fret! Instead, use a wringer — which is good for the environment and your wallet. Need a Custom-Size Spill Containment Berm? Build It Yourself! Do you store or use any type of oil in your workplace? If so, federal regulations require you to have appropriate plans and secondary containment equipment in place for preventing and mitigating oil spills. 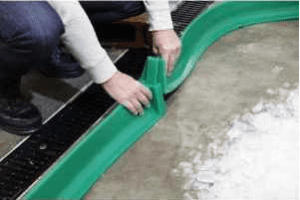 In the event of an oil or chemical spill, a spill containment berm is a valuable tool for preventing dangerous substances from spreading into other areas of the workplace. 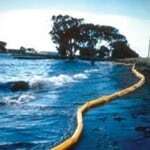 There are many off-the-shelf spill containment berms available, but they may not work for every business’ need. For example, a berm might not fit correctly around the unique dimensions of large machinery, or it might be made of a material that is not durable enough to withstand every application (e.g., polyurethane). 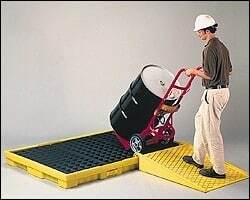 Some custom-made, secondary containment berms are available, such as cement or iron angle curbs, but they can often be costly and pose a trip-and-fall hazard for workers. Luckily, there is an easy-to-use, safe, and economical alternative option: the Build Your Own Berm Kit. The kit provides everything you need to build a custom spill containment berm that will last for years if cared for properly. It comes with all the materials you need: 50 feet of berm wall; corners, connectors, and collars; and the necessary adhesive for quick installation. If your customized berm calls for more materials than you have, you can easily purchase additional pieces at AbsorbentsOnline.com. Installation is easy. 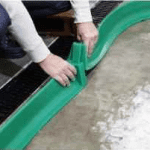 Simply clean the area where the oil spill berm will be installed to remove any grease or oil, and repair concrete cracks or separations before laying out the berm and applying the adhesive. The berm can be used as soon as one hour after it has been installed. See the full instruction sheet here. The custom spill containment berm’s walls and corners are coated in a durable vinyl that can resist coolants, oils, and most chemicals; and is bright yellow so it can easily be seen to reduce tripping hazards. If your workplace environment changes at any point, you can remove the berm with minimal effort by using a flat-bladed shovel. The Build Your Own Berm Kit can help you comply with EPA regulations 40 CFR 122.26, 40 CFR 264.175, and 40 CFR 112.7 and can be a valuable part of your workplace regulatory compliance plan. Workplace safety doesn’t have to be a hassle! Make your business a safer place with this easy-to-use tool. AbsorbentsOnline is here to help. Feel free to contact us by email or call toll free at (800) 869-9633. What’s in Your Acid Spill Kit? Acids and corrosive substances are on hand at many worksites — automobile repair shops, heavy equipment storage yards, and manufacturing facilities, to name just a few. However, the corrosive materials these and other businesses depend on can be dangerous — and even deadly — if a spill occurs and they’re caught unprepared. Having the proper materials on hand to respond to an acid spill is imperative. 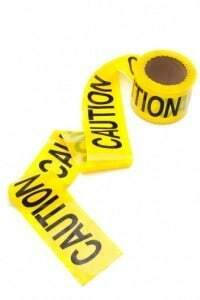 Your worksite should have spill kits placed in all areas where acids are used. These kits should include acid neutralizers and absorbents that are specifically made for acids and corrosives, as well as other basic items for spill cleanup. An appropriate container: You need a container that can hold acids or other aggressive fluids, like the bucket in the Battery Acid Spill Kit. This container is labeled and highly visible, waterproof, and can be used to store contaminated sorbents until they can be disposed of properly. Personal protective equipment (PPE): Depending on the materials handled at your site, your acid spill kit may need a variety of PPE to protect users from aggressive liquids. Basic PPE may include safety goggles, chemical-resistant gloves, aprons, boot covers, and a respirator. Cleaning supplies: Hand brooms or scoops can help spread and clean up absorbent neutralizers. 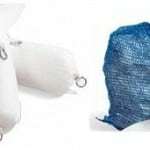 You’ll also need disposal bags to hold used absorbents and contaminated materials. AbsorbentsOnline sells many of these items individually, or you can take advantage of our Battery Acid Spill Kits that include PPE and cleanup tools as well as acid-specific absorbents. You can also contact us about making custom spill kits to meet your needs. Get in touch by email or call toll free at (800) 869-9633. We have hundreds of customers that order special spill kits, and we’re always available to develop the perfect spill solution for your unique business. 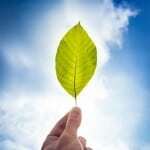 Can Granular Sorbents Be Eco-Friendly? When you clean up an oil spill, chemical spill, or other type of spill, you want to avoid or minimize environmental damage. 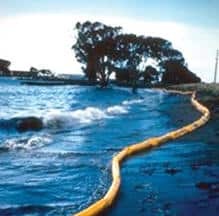 That’s why it’s important to make sure that the absorbent material you use to clean a spill up doesn’t add to the ecological hazards created by spilled substances. Take clay, for example. Clay has long been a mainstay of spill cleanups, but it’s both environmentally unsound and impractical. It takes a lot of clay to remove a spill — ten pounds for every one gallon of spilled oil, to be exact. Plus, it isn’t really an absorbent; spilled liquid simply coats the clay particles, meaning the hazardous material can easily be leaked or spilled again during the disposal process. Furthermore, clay poses respiratory dangers to those using it, and the material isn’t recyclable or renewable. Gran-sorb — With a one-to-one, weight-to-weight absorbency, it doesn’t take a lot of this fiber-based absorbent to soak up your non-aggressive liquids. It’s also made from 100% recycled post-consumer paper waste, and it’s 100% biodegradable, fire resistant, and free of hazardous materials. Super Sorbent — This absorbent is environmentally safe, nontoxic, non-flammable, inorganic, and non-reactive. And to help you ensure you’re always prepared for any oil, coolant, solvent, or water spill, this product is packaged in separate cartons that can be placed throughout your facility. Peat Moss Absorbent — Used exclusively for oils, this handy absorbent soaks up oil spills on any hard surface. It’s biodegradable and can be incinerated. Corn Cob Absorbent — This universal absorbent is made from ground-up corn cobs, which hold approximately four times their weight in fluids. In addition to packing some major absorbing power, it’s also inert, nontoxic, biodegradable, and can be incinerated. Absorbent socks offer an alternative to granular sorbents. A great option is the Corn Cob Absorbent Sock, which is composed of the same super-absorbent ground corn cobs that are in the granular sorbent, but are housed in a polypropylene skin. These absorbent socks are an economical option for handling non-aggressive fluids. The filler is recycled, organic, renewable, and boasts impressive soaking power: A 3 inches by 4 feet corn cob absorbent sock absorbs 1/2 gallon of liquid. 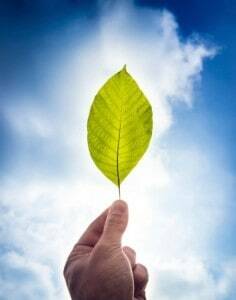 With so many environmentally friendly products available at budget-friendly prices, there’s no excuse not to “go green” when you’re selecting your industrial absorbents.